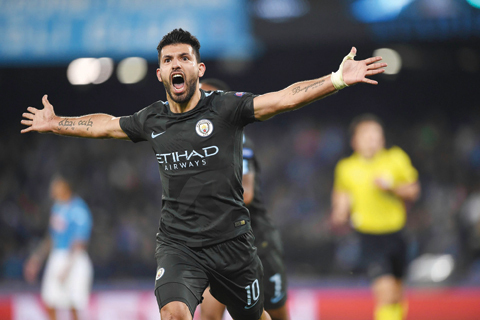 NAPlES: Manchester City’s all-conquering season reached new peaks as Sergio Aguero became the club’s all-time top scorer with a decisive goal in a thrilling 4-2 victory at Napoli that put them into the Champions League last 16 on Wednesday. The Argentine struck his historic 178th goal for City, which took him past Eric Brook’s landmark, in the 69th minute to help settle a magnificent contest between the English and Italian league leaders. Headed goals from City’s unlikely central defensive strike force of Nicolas Otamendi and John Stones either side of halftime had seen Pep Guardiola’s side overturn a 21st-minute lead deservedly given to the Serie A leaders by Lorenzo Insigne. Yet after Jorginho had equalised with a penalty just after the hour, Aguero’s predatory instinct ensured City were not to be denied in their bid to become the first English team to win a European match in Napoli’s forbidding San Paolo Stadium. Raheem Sterling sealed the triumph in injury time, leaving City, now unbeaten in 22 matches, on a perfect 12-point haul in Group F, qualifying for the last 16 with two games left while Napoli face elimination on just three points in third place. It was a victory that once again underlined how City, with their panoply of thrilling talent, look like genuine contenders to lift the European Cup as their performance showcased real heart as well as quality. It was fitting too that an historic goal from their talisman Aguero should decorate the night, with City’s captain Vincent Kompany hailing him as a “true legend”. “I’m very happy for this moment because it’s a one-time moment,” a delighted Aguero told BT Sport. “We must keep going the same way now. It’s a long season and we must continue the same way.” The second clash between two sides who had started the game with 86 goals between them this season always promised to be richly entertaining but City showed real steel in coming from behind for the first time in 13 games to beat Napoli for the second time in a fortnight. Napoli, after dominating the early stages, went ahead by slicing apart City’s defence with the same slickness that Guardiola’s side have themselves been demonstrating all season in the Premier League. Insigne charged down the left flank, took out two defenders by forging a swift one-two with Mertens and beat Ederson expertly from close range. City moved gradually into a higher gear, though. Aguero came close to the record-breaking goal but soon after, in the 34th minute, Otamendi muscled in at the far post to head home Ilkay Gundogan’s pinpoint cross from the right. With momentum having changed completely, Stones headed against the bar and three minutes after the break another of his rocket headers struck the underside of the bar with goal-line technology confirming it had crossed the line. It was the England defender’s third Champions League goal of the season-more than any of City’s attacking jewels. Napoli were far from finished as Insigne hit the woodwork himself with a fine strike and when Leroy Sane brought down Raul Albiol, Jorginho converted coolly from the spot. The defining passages of play saw Ederson make a wonderful save from Jose Callejon before a lightning break from Sane ended with the ball falling to Aguero, who finished in the ruthless fashion that has seen him compile his tally of 178 goals from just 264 appearances.